Imagine yourself in the footsteps of the very first Americans. Standing where they stood 19,000 years ago. Using ancient technology to live off the land. Meadowcroft Rockshelter, the oldest site of human habitation in North America, provides a unique glimpse into the lives of prehistoric hunters and gathers. This National Historic Landmark, located in Avella, Washington County, Pa., features a massive rock overhang used 19,000 years ago for shelter by the first people in North America. The enclosure at Meadowcroft Rockshelter provides visitors with a unique, never-before-seen perspective into the oldest and deepest parts of this internationally-renowned archeological excavation. 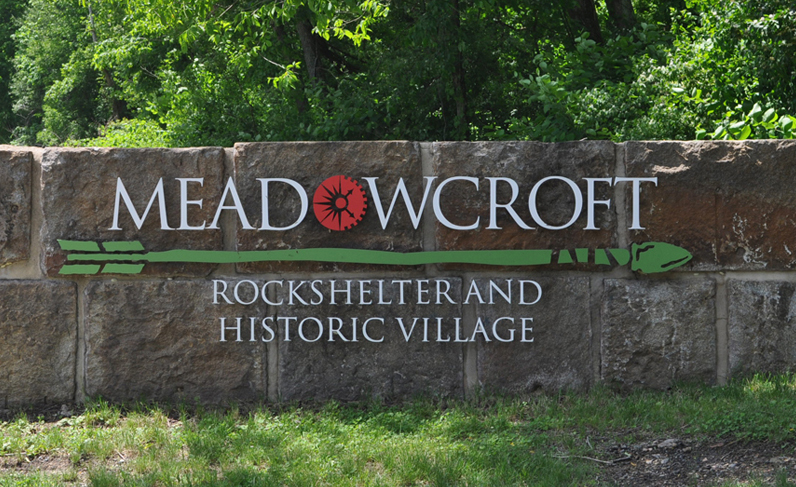 During Meadowcroft’s open season, daily tours of the Rockshelter begin at the Visitors Center. Tour times vary and last approximately one hour. Please contact Meadowcroft directly at 724-587-3412 for more information. In addition to ancient history at the Rockshelter, visitors to Meadowcroft can also step back in time to experience rural life over the past 500 years through a series of interpretive villages, including a 16th century Eastern Woodland Indian Village, an 18th century log cabin and open-sided trading post, and a 19th century village that includes a church, one-room schoolhouse, and blacksmith shop. Travel back 19,000 years with Meadowcroft Director Dave Scofield to learn more about this National Historic Landmark. Thank you to the Observer-Reporter for being Meadowcroft’s media sponsor. Please note that pets are not permitted in any of the museum’s public areas. For those traveling with pets, the grassy area outside of the main entrance gate may be used to exercise pets on a leash. Please be responsible for cleaning up pet waste. Visitors to Meadowcroft can present proof of admission at the Heinz History Center to receive reduced admission. Offer valid same- and next-day only. The admission fee paid at Meadowcroft will be applied toward regular admission at the History Center. Additionally, visitors paying full admission at the History Center can present proof of admission to receive free same- and next-day admission at Meadowcroft. For more information about planning your next visit, please contact Meadowcroft at 724-587-3412 or meadowcroftinfo@heinzhistorycenter.org.